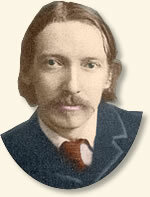 It was 1879 and twenty-eight-year-old Robert Louis Stevenson - future author of the novels Kidnapped and Treasure Island - was in love. Her name was Fanny Osborne. She was an American, ten years his senior and married to another man. The two had met in France three years earlier and Stevenson had fallen hopelessly in love. She returned to California and her husband, but in 1879, Stevenson received a cable from her that immediately set him off on a voyage to be by her side. Stevenson's parents were not happy with his plans and refused to fund his journey - so the young author decided to travel to America as an emigrant. This allowed him to take advantage of the low one-way fares to America offered by the American railroads. 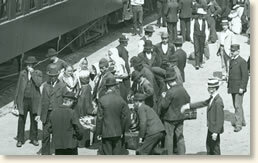 Special "Emigrant Boats" sailed to America's eastern ports and were met by "Emigrant Trains" that carried the foreign passengers to their final destinations. Stevenson kept a journal of his experience and soon turned this into a book. "There was a Babel of bewildered men, women, and children." "There was a Babel of bewildered men, women, and children. The wretched little booking-office, and the baggage-room, which was not much larger, were crowded thick with emigrants, and were heavy and rank with the atmosphere of dripping clothes. I followed the porters into a long shed reaching downhill from West Street to the river. It was dark, the wind blew clean through it from end to end; and here I found a great block of passengers and baggage, hundreds of one and tons of the other. I feel I shall have a difficulty to make myself believed; and certainly the scene must have been exceptional, for it was too dangerous for daily repetition. It was a tight jam; there was no fair way through the mingled mass of brute and living obstruction. Into the upper skirts of the crowd, porters, infuriated by hurry and overwork, clove their way with shouts. The landing at Jersey was done in, a stampede. I had a fixed sense of calamity, and to judge by conduct, the same persuasion was common to us all. A panic selfishness, like that produced by fear, presided over the disorder of our landing. People pushed - and elbowed - and ran, their families following how they could. Children fell, and were picked up to be rewarded by a blow. One child, who had lost her parents, screamed steadily and with increasing shrillness, as though verging towards a fit; an official kept her by him, but no one else seemed so much as to remark her distress; and I am ashamed to say that I ran among the rest. I was so weary that I had twice to make a halt and set down my bundles in the hundred yards or so between the pier and the railway station, so that I was quite wet by the time that I got under cover. There was no waiting-room, no refreshment-room; the cars were locked; and for at least another hour, or so it seemed, we had to camp upon the draughty, gas-lit platform." "I knew I was in a foreign land." "At a place called Creston, a drunken man got in. He was aggressively friendly, but, according to English notions, not at all unpresentable upon a train. For one stage he eluded the notice of the officials; but just as we were beginning to move out of the next station, Cromwell by name, by came the conductor. There was a word or two of talk; and then the official had the man by the shoulders, twitched him from his seat, marched him through the car, and sent him flying on to the track. It was done in three motions, as exact as a piece of drill. The train was still moving slowly, although beginning to mend her pace, and the drunkard got his feet without a fall. He carried a red bundle, though not so red as his cheeks; and he shook this menacingly in the air with one hand, while the other stole behind him to the region of the kidneys. It was the first indication that I had come among revolvers, and I observed it with some emotion. The conductor stood on the steps with one hand on his hip, looking back at him; and perhaps this attitude imposed upon the creature, for he turned without further ado, and went off staggering along the track towards Cromwell, followed by a peal of laughter from the cars. They were speaking English all about me, but I knew I was in a foreign land. " "It was about two in the afternoon of Friday that I found myself in front of the Emigrant House, with more than a hundred others, to be sorted and boxed for the journey. A white-haired official, with a stick under one arm, and a list in the other hand, stood apart in front of us, and called name after name in the tone of a command. At each name you would see a family gather up its brats and bundles and run for the hindmost of the three cars that stood awaiting us, and I soon concluded that this was to be set apart for the women and children. The second or central car, it turned out, was devoted to men travelling alone, and the third to the Chinese. I suppose the reader has some notion of an American railroad-car, that long, narrow wooden box, like a flat-roofed Noah's ark, with a stove and a convenience, one at either end, a passage down the middle, and transverse benches upon either hand. Those destined for emigrants on the Union Pacific are only remarkable for their extreme plainness, nothing but wood entering in any part into their constitution, and for the usual inefficacy of the lamps, which often went out and shed but a dying glimmer even while they burned. The benches are too short for anything but a young child. Where there is scarce elbow-room for two to sit, there will not be space enough for one to lie. Hence the company, or rather, as it appears from certain bills about the Transfer Station, the company's servants, have conceived a plan for the better accommodation of travellers. They prevail on every two to chum together. To each of the chums they sell a board and three square cushions stuffed with straw, and covered with thin cotton. The benches can be made to face each other in pairs, for the backs are reversible. On the approach of night the boards are laid from bench to bench, making a couch wide enough for two, and long enough for a man of the middle height; and the chums lie down side by side upon the cushions with the head to the conductor's van and the feet to the engine. When the train is full, of course this plan is impossible, for there must not be more than one to every bench, neither can it be carried out unless the chums agree, neither can it be carried out unless the chums agree." "A great personage on an American train is the newsboy. He sells books (such books I), papers, fruit, lollipops, and cigars; and on emigrant journeys, soap, towels, tin washing-dishes, tin coffee pitchers, coffee, tea, sugar, and tinned eatables, mostly hash or beans and bacon. Early next morning the newsboy went around the cars, and chumming on a more extended principle became the order of the hour. It requires but a co-partnery of two to manage beds; but washing and eating can be carried on most economically by a syndicate of three. I myself entered a little after sunrise into articles of agreement, and became one of the firm of Pennsylvania, Shakespeare, and Dubuque. Shakespeare was my own nickname on the cars; Pennsylvania that of my bedfellow; and Dubuque, the name of a place in the State of Iowa, that of an amiable young fellow going west to cure an asthma, and retarding his recovery by incessantly chewing or smoking, and sometimes chewing and smoking together. I have never seen tobacco so sillily abused. Shakespeare bought a tin washing-dish, Dubuque a towel, and Pennsylvania a brick of soap.. The partners used these instruments, one after another, according to the order of their first awaking; and when the firm had finished there was no want of borrowers. Each filled the tin dish at the water filter opposite the stove, and retired with the whole stock in trade to the platform of the car. There he knelt down, supporting himself by a shoulder against the woodwork; or one elbow crooked about the railing, and made a shift to wash his face and neck and hands-a cold, an insufficient, and, if the train is moving rapidly, a somewhat dangerous toilet." This eyewitness account appears in: Stevenson, Robert Louis, The Amateur Emigrant (1879); Furnas, J.C., Voyage to Windward: the Life of Robert Louis Stevenson (1951). "Traveling on an Emigrant Train, 1879" EyeWitness to History, www.eyewitnesstohistory.com (2006). Fanny Osburne obtained a divorce from her husband and she married Stevenson in the Spring of 1880. They remained together until Stevenson's death in 1890.